The Profile Form in FACULTY180 is used by faculty members to input personal data that tends to remain static over time, such as contact information, degrees, credentials, and work experience. Faculty members can update their profile at any time, if allowed by an institution. Faculty members are also reminded on a regular basis to review their profile to make sure it is current. These reminders are displayed in the Action Items section on the Dashboard. 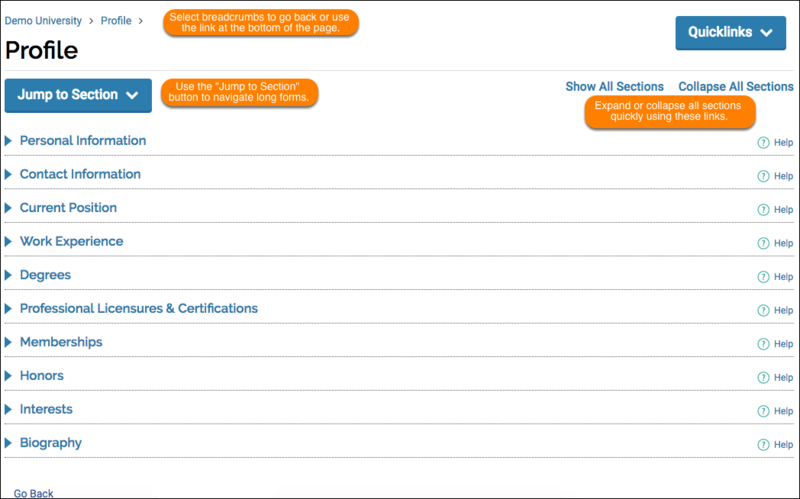 Faculty members can attach transcripts to their degrees in the Degrees section on the Profile Form. The transcripts can then be viewed and deleted as necessary. Administrators can also attach official transcripts to faculty degrees; however, the transcripts are only viewable in limited circumstances as determined by your institution, such as during the use of accreditation reports. Faculty members cannot delete transcripts that have been attached to a degree by an administrator unless the faculty member has administrative rights. If your institution wants to upload transcripts for the Degrees section on the Profile Form, please contact Interfolio. Some sections in the Profile Form are filled in automatically based on information in other forms in FACULTY180. If you have any questions about your permissions or abilities to edit this information, please reach out to your FACULTY180 administrator at your institution. On the Navigation bar on the left-side, click Profile. Click the section title to expand the section that you wish to make changes to. Click the Edit icon corresponding to the information you wish to change. (To add information to the Profile Form, click the Add or Edit button). Make the desired changes, then save them at the bottom of the relevant screen. The changes are saved in the Profile Form.